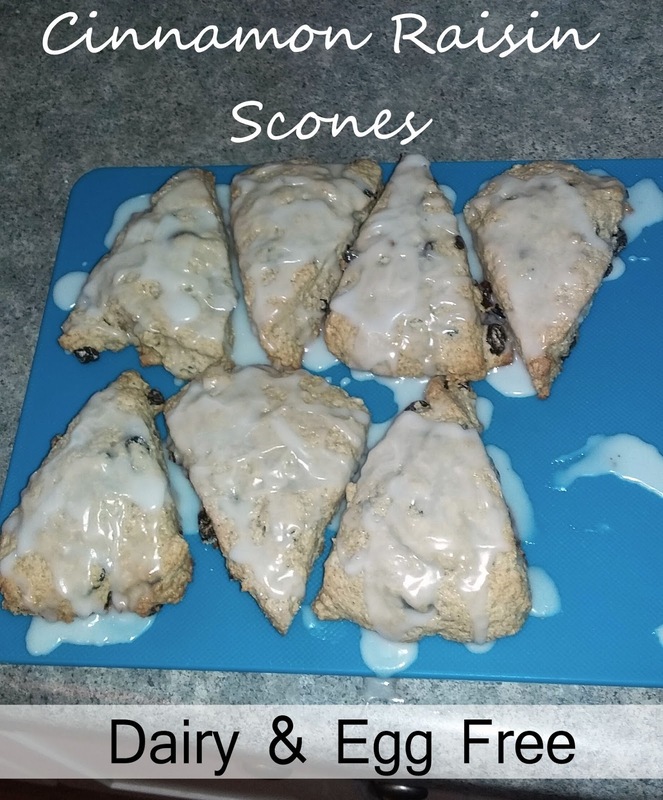 The recipes makes 8 scones....but they were so irresistible that I ate before I could take the picture! 2. In a medium bowl, mix flour, 1/3 cup sugar, baking powder, baking soda salt, and cinnamon. Cut butter into flour mixture ; use your fingers to work in butter (mixture should look like coarse meal), then stir in raisins. 3. In a small bowl, whisk sour cream and applesauce until smooth. 5. Place on a lightly floured surface and pat into a 7- to 8-inch circle about 3/4-inch thick. Sprinkle with remaining 1 tsp. of sugar. Use a sharp knife to cut into 8 triangles; place on a greased cookie sheet (or use sheet lined with parchment paper), about 1 inch apart. Bake until golden, about 15 to 17 minutes. 7. Make icing by combing sugar and almond milk. Add icing to top and serve warm or at room temperature.